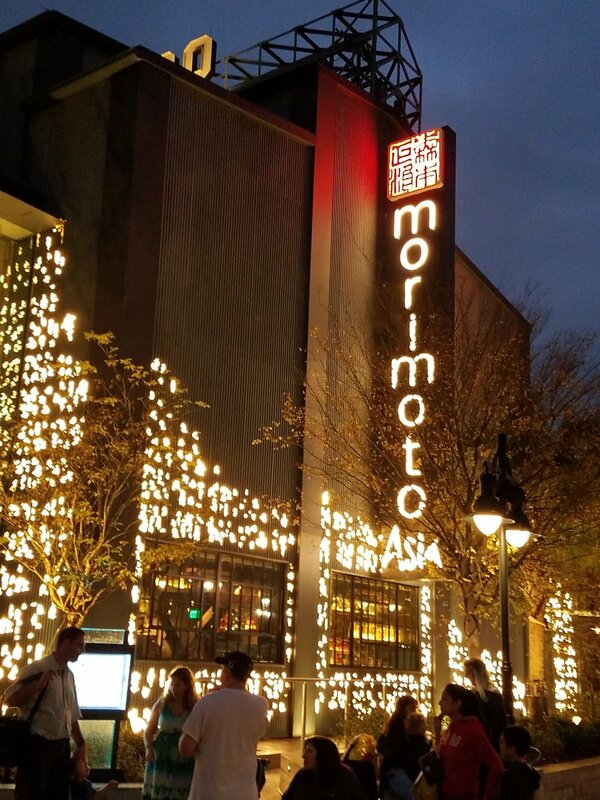 Disney Springs has opened many new restaurants within the past 2 years, one of which is, Morimoto Asia. This new restaurant features a Pan Asian menu from Iron Chef Masaharu Morimoto. I recently had the opportunity to dine there during my agency training this past January.The restaurant has 2 floors with both indoor and outdoor seating, a bar area and tables with a view of the chefs cooking in the kitchen. The inside of the restaurant is beautiful featuring long rectangle shaped boxes of Christmas style white lights hanging from the ceiling. It is dark wood décor with a soft lighting glow. They offer unique curved booths and both square and round tables as seating options. Due to the high ceilings and open concept, it can get quite loud in there and you feel like your shouting at times to be heard. The menu features sushi, appetizers/dim sum starters, side dishes, chef specials, entrees, soups and salads, desserts and a wide range of beverages, including alcohol. The way the menu is set up, it is better to order a bunch of plates and share family style. You certainly can order a few items for yourself but it will get pricey quickly ordering that way. We had a table of 11 people and ordered individually offering others a bite of our meals to taste. However, when you have a large group of people with very different taste buds, it could prove challenging to order family style. Ordering individually on a budget you are forced to choose one or maybe two options. This restaurant does participate in the Disney dining plan but at 2 table service credits per person, it is not a wise choice of your meal credits in my opinion. You would be better off paying for this restaurant out of pocket. It does offer a 20% discount for Tables in Wonderland. As for the food itself, it was very good. I had a sake sangria which was very good. I also enjoyed the Lo Mein Noodles with Beef which was also very tasty and offered plenty to eat. Other agents at the table had the Hot and Sour soup and the Morimoto Spare ribs which I was able to try both and enjoyed their unique flavors. The overall consensus from our group was the food was good but pricey if you ordered several plates of food options per person. If you enjoy Asian food, this is worth checking out. However my advice is to check out the menu online ahead of time and consider ordering family style with your dining party so you can taste all the wonderful flavors the restaurant has to offer.